What better time to predict what type of winter we are going to have than when our first storm of the season is knocking at the door. In fact, a series of storms will be dropping out of the Gulf of AK and into our area. Although none of these storms are very impressive, they will change our weather with high temps 20-30 degrees cooler than the last week. This pattern will continue for about 7-10 days and then perhaps we will see some 70's again. The above chart shows that we went from a strong El Nino to now a neutral ENSO. Actually, Equatorial sea surface temps are now ranging below average and if we do not slip into a La Nina this winter, we have an excellent chance next winter. 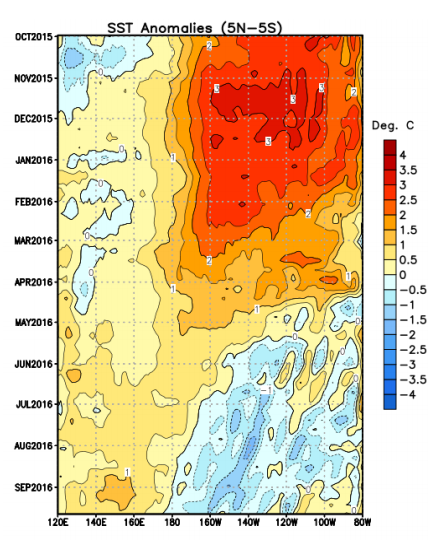 Quite frankly I do not believe much in predicting Tahoe winters based on the El Nino Southern Oscillation (ENSO). As we saw last year, this is not a terribly reliable measuring stick. In fact, our snowiest winter in history occurred during a strong to moderate La Nina. Despite conventional wisdom saying that La Nina kicks the storms north. Using ENSO to make very broad weather predictions, however, can be very useful. For example, a strong to moderate El Nino will be associated with average precip for Tahoe or more. Again, very broad but at least we get some idea of what may be coming. Therefore, I look for slightly above average snowfall for this year. 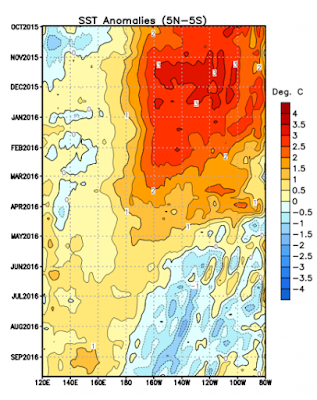 I base this on a couple of things; The year after an El Nino is rarely dry. Also, we are due. Four of the last five winters have been very dry and we have averages for a reason. I do not buy into increased Carbon in the atmosphere means dry winters for Tahoe. In fact, if you read Paul Huntington's analysis, increased Carbon levels could have the opposite effect. Having said all that, Paul is with us again this year and we are very pleased here at TWB. Paul's 2016/2017 outlook is published unedited in the next section It is important to remember, that these predictions are us humans trying to evaluate a very complex machine that still has many variables beyond our comprehension. As variables change (and they will) we will continue to publish outlooks. Paul was by far the most accurate long range forecaster last year. There were times when I wondered if Mr. Huntington had a crystal ball! I have been doing some research to find a pattern that might reveal what to expect in the 2016-2017 Winter and two years are jumping out at me-1958-59 and 1983-84. These years followed rather strong El Ninos but NOT with cold negative ENSO SST's but more neutral ENSO numbers with warm equatorial waters directly below Hawaii migrating above and around a cooler pool in the central eastern equatorial Pacific. This pattern is supportive of average to below average precipitation but not a "severe" drought pattern. There is a possibility of below average rains from what historic Modoki El Ninos reveal but i'm feeling this will not happen and we should fall in the average to maybe a little below average rainfall department. Moreover, the ocean atmospheric coupling and global teleconnections appear to create larger planetary waves that bring troughing to the West Coast around mid November (*November 1958 was dry but this is very abnormal pattern following a strong El Nino and would be surprised if this year is that dry), and mid/late December when we can expect a nice run of wet snowy weather. I feel fairly confident in this Fall/ early Winter prediction but things get tricky in January and February and no real patterns are revealing. It does appear during neutral/weak EL Nino Modoki ENSO years strong ridging does take hold into January but with weaker storms still impacting and skirting just North of the Sierra every week or so, however, there is a high possibility of one or two stronger lows tapping into an atmospheric river and undercutting the ridge. These AR events appear to take place any where from early January to mid February and could bring flooding rains to anywhere between Mt Shasta and Mt Baldy in Southern California. Lastly March and April look dry but that is not set in stone yet!! Lots can still change and this is just a fantasy forecast remember.